When Harold opens the door to a strange man and boy, he sees someone he knew he would never see again. “Synapses kicked on in the recesses of his brain. They crackled to life and told him who the boy was standing next to the dark-skinned stranger. But Harold was sure his brain was wrong.” On that day, the lives of Harold and his wife Lucille change as they become involved in the whirlwind which is the return of people from the dead. This is the beginning of The Returned by Jason Mott. People look for an explanation: the Church has none. They look for a plan: the Government has none. The slow slide of disintegration is told through the eyes of the elderly couple, Harold and Lucille Hargreave, as they grapple with deep questions: what are the Returned, are they real, are they ghosts, what rights do they have? This book is at the same time a glimpse of a dystopian society, and at the same time an examination of death and grieving, of our attitudes to honour and betrayal. The wish of a grieving person is to see the dead person just once more, but Jason Mott has created a world where people achieve that dying wish and then don’t want it. This book asks a lot of difficult questions, ones we would rather not hear. 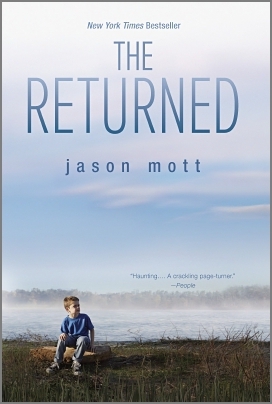 Watch the book trailer for The Returned here. It will make you want to read the book!